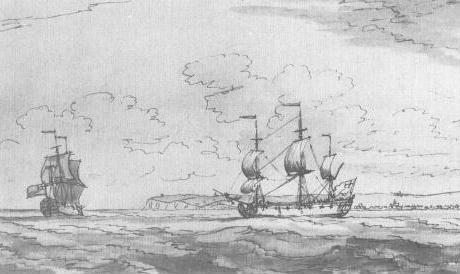 Monamy has left a considerable record of portraits of specific ships, often composed in the traditional manner, which goes back many decades before his time and persists throughout the 19th and even 20th centuries. 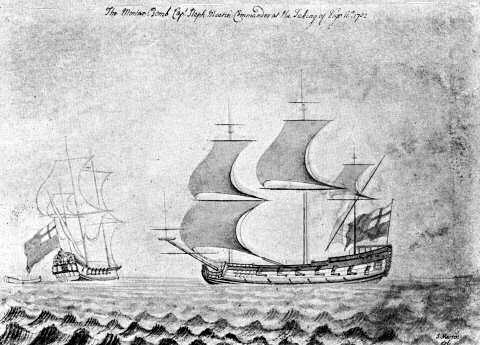 These depict the vessel either from a formal port or starboard flank view, with the composition rounded out by one, two, or sometimes three other views of the same ship from different angles. 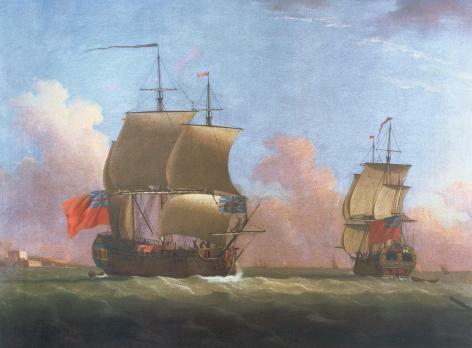 Occasionally the portrait takes on the character of a realistic composition, so that it can seem as if two different ships are being portrayed. 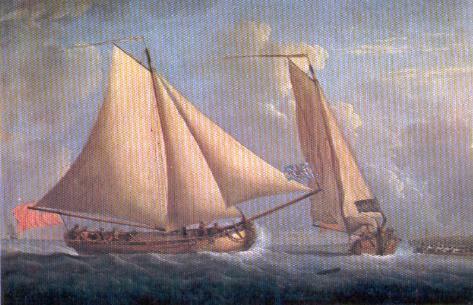 The painting heading this page must be regarded as an exact portrait of a specific yacht. Note 2016: It is no longer considered to be by Monamy, or his studio. 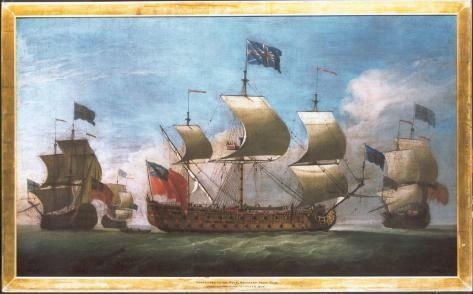 Above is a conventional ship portrait signed S.Martin del, a naval officer who was the brother-in-law and heir of Sir John Leake. 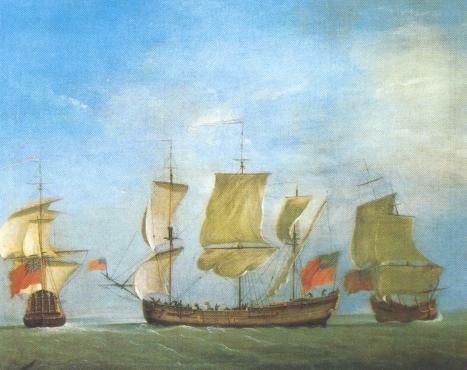 Captain Stephen Martin's dates are 1666-1740. 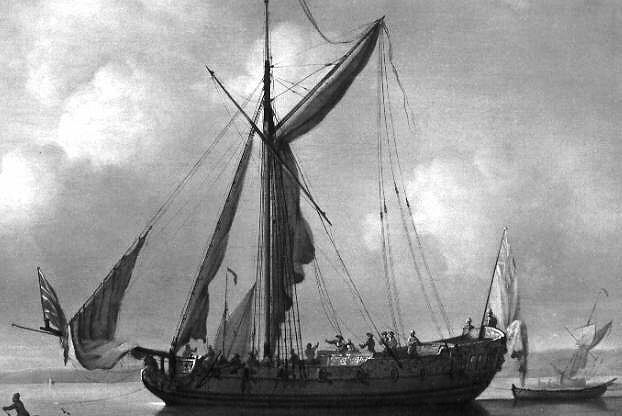 It might be suggested that in his ship portraits Monamy was following a style introduced by the Elder van de Velde. Michael Robinson did in fact make this suggestion. 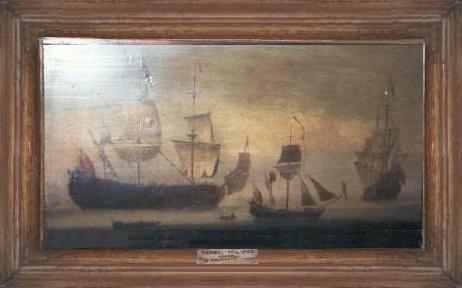 However, the traditional ship portrait goes back a very long time, well before the arrival of the van de Veldes in 1674. Is this by Monamy ?